There are people who impress with both their intellect and the work they have done so far. Georgi Marinov a.k.a. 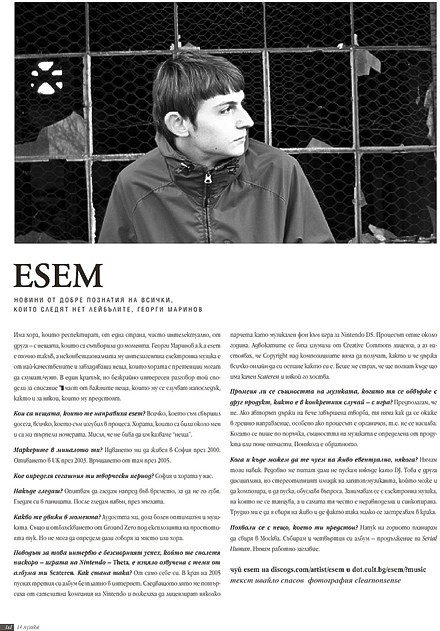 Esem is one of those people, and his unconventional electronica is of the most captivating and highest quality music that opinionated people can listen to. In a short, but very interesting talk, he shared for Edno magazine some of the important things that are happening to him, and also spoke about a few others down the line. What are the things that made you Esem? Everything I've done so far, and everything I have lost in the process. The people, who were around me and showed real patience. I don't think I should refer to them as 'things'. What are the cornerstones in your past? Moving to Sofia in 2000. Moving to the UK in 2003. Coming back to Bulgaria in 2005. What determines your current phase? Sofia and the people in Bulgaria. Where do you look towards? I try to look ahead in time, so as not to lose it. I look at my plate. Then I look outside, into the fog. What is driving you at the moment? Part craziness, part unhealthy optimism, and the music. Also the shock wave from ground zero, under the explosion of stupidity here. But I am not sure if I speak about place or people. The reason for this interview is the recent success you've had with Nintendo's Theta, which uses music from your free labum Scateren. How did that happen? A lot of it happened by itself. In the end of 2005 I released my third album for free downloading on the Internet. The next summer I was contacted by a production company who work with Nintendo. They wanted to license a few tracks as background music to a game for the Nintendo DS. The process took about a year. Creative Commons presented a problem with their lawyers, but I did not want to grant them exclusive Copyright, and also wanted to protect the files already released online. I was scared that they will push everyone to take copies of Scateren off the net. Does the nature of music change when it is bound to a commercial product, or in this case - to a game? I guess not. If the author is careful about a finished work, it cannot go in the wrong direction, especially if the process is organic, i.e. there is no pressure involved. When music is written specifically for a project, its nature is predetermined by the product, or at least to some extent. Sometimes it's the other way round. When and where can we hear you live.. eventually? I'm not in the habit of playing live. I get asked every so often if I DJ. This is a whole other discipline, and the laptop musician's stereotypical image as a person who produces and DJs somehow contributes to the reasoning. I do music which you cannot dance to, as the music itself is syncopated and in odd signatures. I find it hard to play this live, and it feels like I am shooting myself in the foot by not playing live. Can you share anything from your future plans? Despite what I just said, I am playing live in Moscow soon. I am also working on my fourth album - a sequel to Serial Human. There is no working title. Interview taken by Ivaylo spasov.